Funny though this play is, if you know nothing about the internet and the celebrities it creates, Prank might not be the show for you at the 2018 Toronto Fringe Festival. However, if you’re reading this review now, you have probably figured out something about the internet already. 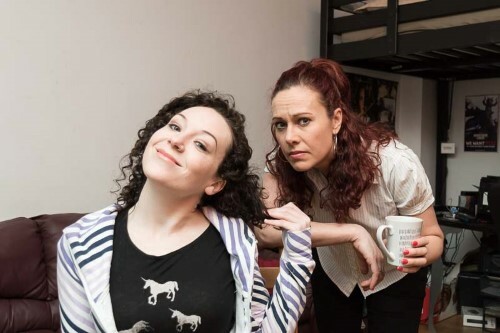 In this show, co-produced by Thundermind Theatre and DutchGirl Productions, two sisters teach us and each other about how to be truthful in a world of hoaxes. Starring Cydney Penner as younger sister Ruthie and Christel Bartelse as Cal, the newest work from writer-director Danny Pagett gently starts with Ruthie in front of her laptop broadcasting a live entry of her vlog. Ruthie wants to be an internet celebrity, and her 23,000 fans just aren’t enough. So she’s about to make a revelation about her roots when Cal walks in. As the show’s description for the Fringe program states, this is a play about “the gold rush for internet fame” and how two children of former internet celebrities struggle with that legacy – for both their present and future selves. Set in 2038, Prank probes the fall-out of the past upon a second-generation of internet stars while referencing new hypothetical technologies that probably will come into existence. Plot-wise, I can’t reveal too much more without giving away some of the twists and turns of the show. See, while the show is funny, it hinges on a lot of revelations; revelations that these sisters have been keeping from each other for – in some cases – years. Today will be the day when it all comes out. Penner plays the brattier younger sibling with a petulant flair, adopting a phoney higher-pitched voice for her online persona. The whine she adds to her voice reminds me of a person eager for attention. Her timing is strong. Bartelse nails her role as the more practical sister. She has made sacrifices. She does not want to be seen on camera. She’s willing to look out for her sister but not to protect her indefinitely. Bartelse plays the character so naturally that it’s tough to tell where the actor ends and the role begins. Shout out to Andy Trithardt’s sound design which perfectly punctuates the action with its webcam pings and blips. My qualm with the show lies in the writing. It’s funny, it’s topical, and it’s on-the-nose. But the constant need to shift the playing ground under the characters’ feet with one disclosure followed by a betrayal then an epiphany becomes exhausting. Instead of dealing with the consequences of the new information, the play sometimes feels like a game of one-upmanship. That said, Pagett’s pacing as a writer and director is note-perfect: what a way to lead a fifty minute show. Ultimately, Prank is about distinguishing between real life and internet reflections, allowing the truth to be what we live in and not a projected fantasy avatar in a make-believe world. But that doesn’t mean we can’t laugh a little along that road to discovery/recovery.